Welcome to Oxide and Pigment Corporation. Manufacturer and Exporter of Iron Oxides, Chemical Compounds, Adhesives, AAC Blocks and PVC Moulds. The company was incepted in 1994 at Ahmedabad. We are in association with Oliver India Ventures Corporation and we export to East Asia, Europe, South Africa and Kenya. Convenient payment options and transparent business practices help us to serve Clientele like Somani Tiles and Premier Industries. We offer a wide assortment of Green Chrome Oxides, Chemicals Hardeners and Industrial Adhesives. PVC Moulds, AAC Blocks and Green Oxides offered by us are available at industry leading prices. Red and Yellow Iron Oxides are reckoned all over the world for their superb quality. We have gained tremendous expertise in providing Sodium Tripolyphosphate and Chemicals Leckers that are cost effective. We are a leading firm engaged in offering Iron Oxide Black 300 and PVC Moulds for Paver Blocks that are highly efficient. 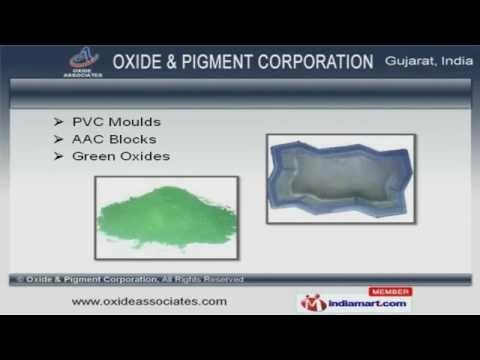 Pigments for Plastics, Iron Oxides for Paints and Coating Industries are one of the best in the market.